AmaWaterways has had a presence in the Mekong since 2009 and AmaDara, which launched in 2015, is currently its only vessel on the river. The ship sails the Mekong through Vietnam and Cambodia from August to the end of April each year. The pace of these trips is relaxed and quiet, and the look and feel of the ship is designed to reflect the style of the region with lots of shiny wood -- from floors and paneling to intricately carved room dividers -- and fresh orchids throughout the vessel and even in the cabins. Authenticity and Western options in everything from food to decor. Pace can be slow for more active travelers and families. A well-crafted regional overview with excellent service and dining. The pace onboard is designed to show passengers life on the river without offering a schedule that's too challenging or taxing. On our sailing there were several families traveling with children, and the kids -- who ranged in age from kindergarten to high school -- seemed to enjoy the experience, though without organized activities onboard designed for little ones, it was on the parents to keep them entertained. 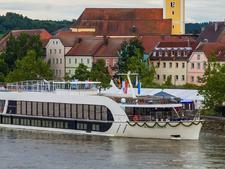 Passengers on this ship tend toward retirees and empty-nesters. They're generally English speakers, but not always American – and often you will find plenty of Brits and Canadians as well as a smattering of Aussies and English speakers from other parts of the world. This is a casual ship, all day long, with no formal dress code requirements for dinner. Pack lightly and comfortably, both for the potential muddiness of some ports and for the hot weather of the region. Some passengers pack a slightly nicer outfit for the Chef's Table restaurant and the farewell dinner, but the line does not impose any restrictions. Some tips, many drinks and all shore excursions are included in the fare. While wine is included at meals, both wine and cocktails -- except for those using local libations -- come with a fee in the lounge. Free internet and Wi-Fi are available throughout the ship, and there are also a couple of computer stations set up onboard for those who didn't bring laptops. The internet is fast enough for social media, email and surfing, but uploading photos and streaming video is not suggested. Gratuities are not included and the line suggests that you tip the crew $10 per person per pay and the cruise manager $3 per person per day. For bar bills and spa service, tipping is not required. All bills are listed in U.S. dollars.